Current Perspectives on Medicinal and Aromatic Plants (CUPMAP) is an open access, peer-reviewed and refereed international journal published by MESMAP scientific group. 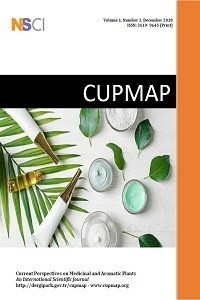 The main objective of the CUPMAP is to provide an intellectual outlook on the scientific researches on Medicinal and Aromatic Plants. CUPMAP have distinguished goals to promote interdisciplinary scientific studies in which results could easily be used in industrial production on MAPs. This international scientific journal publishes research papers related to Medicinal and Aromatic Plants in the fields of science and technology such as Biology, Molecular Biology and Genetics, Chemistry, Agriculture, Biochemistry, Botany, Ethnobotany, Environmental Science, Forestry, Horticulture, Health Care & Public Health, Nutrition and Food Science, Pharmaceutical Sciences, and so on. CUPMAP publishes original research papers, applied studies, and review articles in MAPs science and technology. Special Issues devoted to important topics in the MAPs science and technology could also be published. Having well known board members distinguished scientists from different disciplines with huge experiences on MAPs all over the world, CUPMAP will be indexed in many databases after first issue. The goal of the journal is to be indexed in Thomson Routers in a short time. CUPMAP is inviting papers for Vol. 2 No. 1 which is scheduled to be published on May 30, 2019. Last date of submission: May 01, 2019. However, an early submission will get preference in case of review and publication process. University of Near East, Faculty Of Pharmacy, T.R.N.C.